My almost three-year-old daughter is starting to be more and more interested in princesses. The other afternoon when her brother had a friend over, we decided to have some Mom & Tot Craft Time to keep her occupied and out of their way. 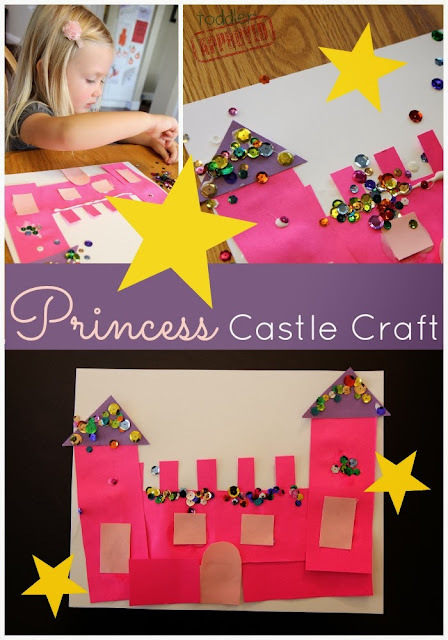 We grabbed some paper scraps, scissors, sequins, and glue and created a sparkly princess castle craft! Before we got started, I pre-cut several shapes out of cardstock. Then we talked about what castles looked like and worked together to build ourselves a paper scrap castle! My daughter is very enthusiastic about glue and squeezing a lot of it into one giant blob, so I taught her my glue mantra- "a little dab'll do ya" and we practiced squeezing control and how to use the large amounts on her paper to help us glue down the rest of the picture. She was also really excited about the sparkles, so she layered the sequins onto the castle in piles. Once the glue was dry, we shook the sparkles off the picture and we had a lovely sparkly castle to admire! While we crafted we talked about our favorite princesses and our favorite Disney princess songs. My daughter is currently singing I See the Light on repeat from Tangled all day long. 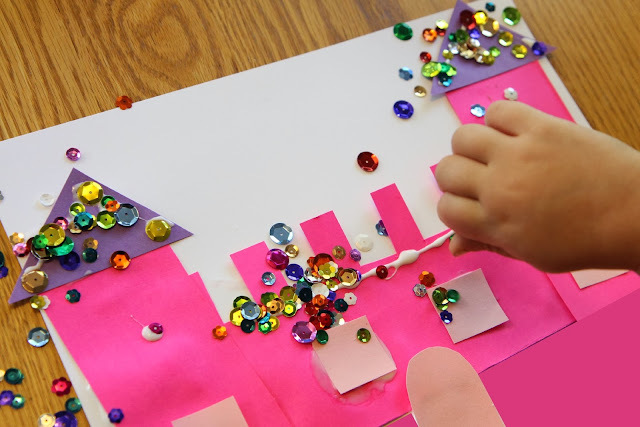 This craft was just for fun, but we did chat about colors & shapes while we created it! My daughter got the Little People Disney Princess Songs Palace from my parents last Christmas and it has been her favorite toy all year. She loved that she got to create her own castle craft just like the toy one in her playroom. By the way, have you entered our Learning Resources Dinner Set Giveaway yet? Don't miss out!